Check Out Our Disabled Outdoor Products Here! Simplicity is difficult in normal life, but if you are disabled, this can be even more of a challenge. With life moving at the speed it currently is, having a little bit of help can make life simpler and thus you can have the benefit of achieving simplicity. This innovative and easy to use invention will make it possible to watch wildlife for hours on end. Whether your arms are disabled or not, this stand can be extremely useful in providing some much need rest for your legs as well. Should you choose to add binoculars or a camera, this innovative stand will gently rest upon your legs and give you hours of entertainment in the wildlife and the ability to take crisp and still photos without having to worry about the normal shakes of life. Finally the stand has a 360 degree pivot range and only weighs 3 lbs without binoculars. That can be adjusted to a total 11 inches, aluminum frame will provide you with durability if it should fall. 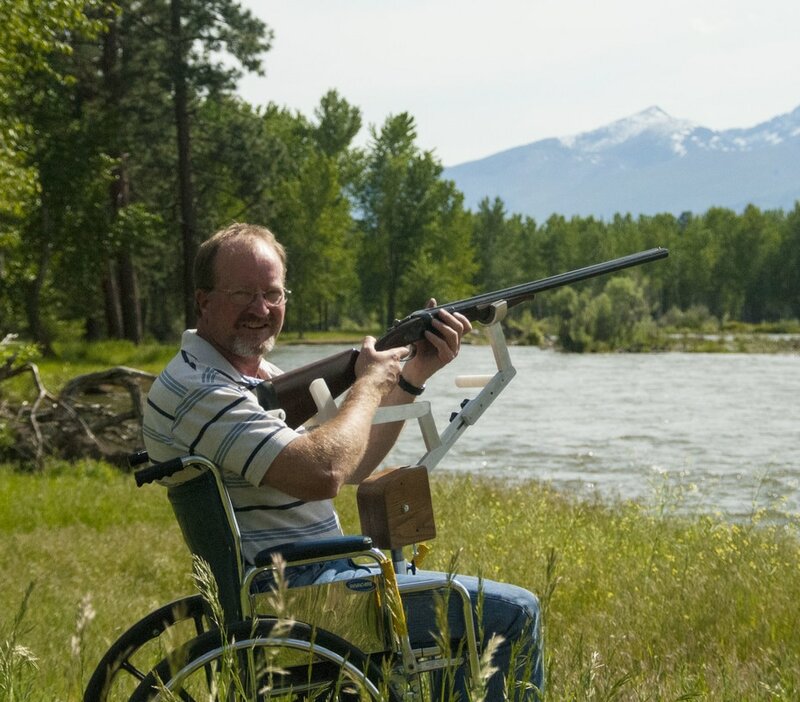 Are you disabled, but you still love shooting and hunting? Having a rifle rest can provide you with comfort and extra consistency with every shot. Whether you are a quadriplegic or a paraplegic, these rifle rests will give you a 360 degree rotation and they can easily be attached to you chair or wheelchair, should you be in a wheel chair. The rifle rest will provide you with the perfect opportunity to make the perfect shot and they will allow you to move from side to side to increase your shooting range. If you are tall, these rifle rest will also offer you the capability of adjusting upwards or downwards and the rest will allow you to pivot you gun up or down while still keeping you in total control of every movement. Finally, having a rifle rest will provide you with extra strength for the heavier rifles and also give you a more accurate shooting experience. It is very cool to watch a guy use the rifle rest at a Wounded Warrior event, a man who would not have been able to enjoy this type of activity without the rifle rest. This is why we do what we do! While many of us enjoy fishing, it can be quite difficult task to consistently hold your fishing rod while waiting for that big bite. The fishing pole holder will eliminate the need to steer between the regular holders and the social area. Now you will have the opportunity of keeping the rod with you and you can be the first to act if that big fish bites. The fishing pole holder can easily be attached to you seat, using a 3/16 Allen wrench and will provide you comfort while enjoying the outdoors. You can easily just put the rod on the holder and you will have your hands free to enjoy something to drink. Finally the aluminum sheet can be used for both the rifle rests and fishing rods, making this a great combination to buy together. I have ordered the “Binocular and Camera Stand”, and found it to be a very useful and unique product that gave a solution for my need to look at nature sights for a long time, without any effort. Scot was very patient and helped me understand the way to work with the stand with his kind guidance until I was 100% happy with the control of the mechanism and ability to function the product. I highly recommend his company, and this specific product.